A luxurious extra heavy weight court wedding band crafted in 18ct gold and measuring 3mm in width. A stylish accessory designed to mark the start of your new chapter. 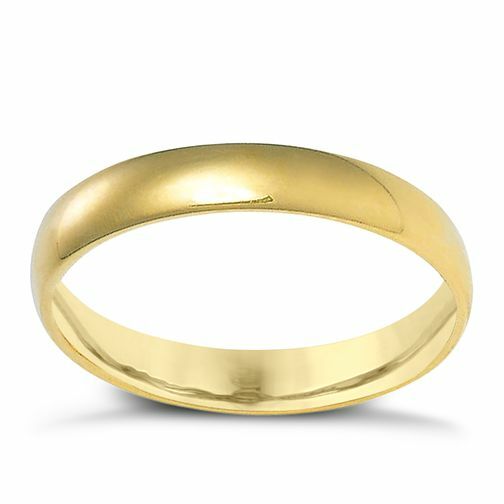 18ct yellow gold 3mm extra heavyweight court ring is rated 3.5 out of 5 by 2. Rated 2 out of 5 by Anonymous from Lovely ring but... Lovely solid ring, looks great on, but I'd only been married a day and found a scratch on it. Its obviously a ring that's not going to age very well. For the price, I would have hoped that it would wear better. Very disappointing. Rated 5 out of 5 by pingujam from Solid wedding ring Lovely ring, should last for a long, long time as it's very good quality 18ct gold. It looks very smart too.